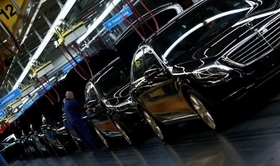 Workers assemble Mercedes S-class models at the automaker's plant in Sindelfingen near Stuttgart. FRANKFURT (Reuters) -- Ride-hailing service Uber has sounded out car companies about placing a large order for self-driving cars, an auto industry source told Reuters. "They wanted autonomous cars," the source, who declined to be named, said. "It seemed like they were shopping around." Germany's Manager Magazin reported that Uber had placed an order for at least 100,000 Mercedes S-class cars, citing sources at both companies. The S class does not yet have fully autonomous driving functionality. Mercedes sold about 100,000 S-class models last year. Another source familiar with the matter said no order had been placed with Mercedes. Daimler and Uber declined to comment. "We don't want to end up like Nokia's handset business, which was once hugely profitable...then disappeared," a second auto industry source said about doing a deal with Uber. So-called "autonomous vehicles" have for years been a distant dream but technology advances and a push by Google , with its huge financial resources, to introduce a prototype have shifted the race to build them up a gear. Analysts at Exane BNP Paribas have said they see a $25 billion market for automated driving technology by 2020, with vehicle intelligence becoming "the key differentiating factor." But the brokerage does not expect fully automated cars to hit the road until 2025 or 2030, in part due to regulatory hurdles. In August 2013, Mercedes-Benz responded to the Google push by developing an S-class limousine that drove between the German towns of Mannheim and Pforzheim without any driver input. The 64-mile stretch is known as the Bertha Benz route, named after the driver of the first ever car, around 130 years ago. "The value creation is shifting from the actual hardware toward software and services," BMW's new CEO Harald Krueger said on Wednesday. That shift is expected to accelerate with the emergence of computer-driven autonomous vehicles, and BMW is investing in software and technology expertise as a result.